Will Smith is pictured in the new sneak peek painted entirely blue, with a shaved head, goatee and gold jewellery. He channels a mix of humor, punchiness, and vanity on the screen, just like Robin Williams, who voiced the magical character in Disney's original Aladdin animated flick. 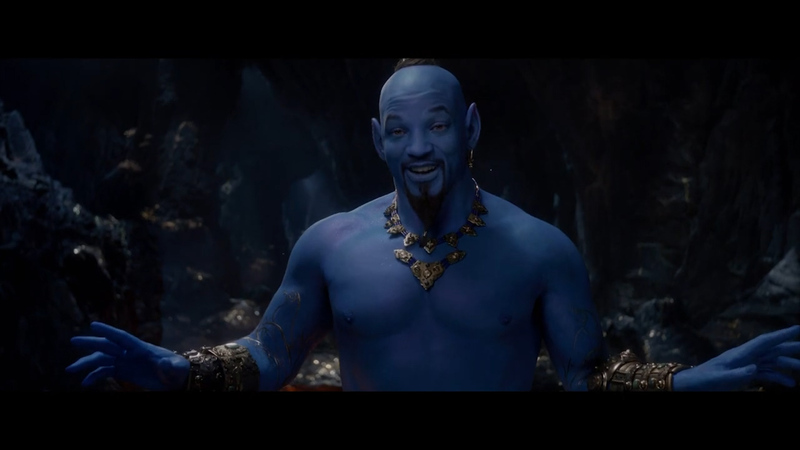 After all, was there even the slightest chance that a blue Will Smith wasn't going to look at least a little ridiculous? Directed by Guy Ritchie, the Aladdin remake will be released in May and stars Will Smith, Mena Massoud as Aladdin and Naomi Scott as Princess Jasmine. "It's so spectacular, it's such a attractive movie and I can't wait for people to see it". In the teaser, we got our first look at Massoud as Aladdin in the famous scene when Aladdin enters the Cave of Wonders, which is also when fans got their first look at Genie's lamp from the new film. 90s babies have been interested in the live-action remakes of two films this year: Aladdin and The Lion King. Smith posted the trailer to his Instagram along with the message, "I told y'all I was gon' be Blue!" "Aladdin and Jasmine have different outfits, why not just Will Smith in a cool genie outfit", she tweeted, raising a valid point about how easy it is for bad CGI to completely ruin what could have been an wonderful movie. "Genie, wishes, lamp? None of that ringing a bell?" And with that being said, the bald look just seems so much more natural with this color. The film will drop in theatres from May 24, 2019 in the United Kingdom, and May 23 in Australia and North America. Smith takes on Robin Williams' former role as the Genie to bring a "hip hop flavor" to the part, reported Variety.